An unlikely love triangle: an ambitious Brooklynite graphic novelist and his peculiar neighbor fall for the same beautiful but broken girl. The three combat abandonment, addiction and the struggle with conforming to traditional relationships. 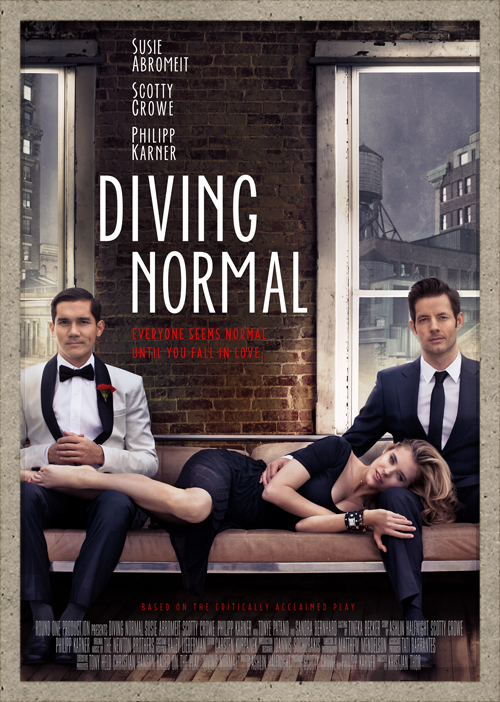 Diving Normal is now available across American Cable in Movies on Demand! ​Fulton, an ambitious Brooklynite graphic novelist, and Gordon, his socially awkward neighbor, are best friends who both vie for the attention of Dana, a beautiful but damaged girl. Fulton and Dana begin dating, but the increasingly complicated situation is compounded by their pasts of abandonment, accident, and sexual deviation. After discovering that Fulton has gone to visit his ex-girlfriend, things take a dark turn as Dana relapses and debases with drugs and alcohol. Gordon becomes Dana’s caretaker, and as they grow closer, the trio’s relationships are tested. Based on a play, Diving Normal explores loyalty amongst friends and lovers, as well as the heartbreaking personal struggle of becoming an adult.